A top UN expert on sanitation said that the flagship project of the Narendra Modi government lacked a holistic human rights approach. 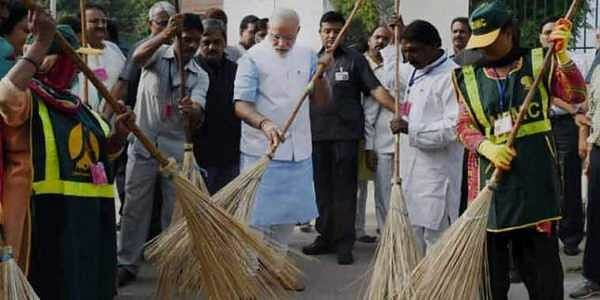 NEW DELHI: “Swachh Bharat' mission”, flagship project of the Narendra Modi government, came in for sharp criticism by a top UN expert on sanitation who said it lacked a holistic human rights approach. While the comments of the UN expert referred to Mahatma Gandhi, it drew strong criticism from the government which said that it is ‘serious insensitivity towards the Father of the Nation’. “In the last two weeks I have visited rural and urban areas, slums and settlement camps where undocumented population is residing... and I have found that these initiatives lack a more human rights approach,” said Léo Heller, Special Rapporteur on the human rights to safe drinking water and sanitation. A press release by the office of the High Commissioner, United Nations Human Rights, on the issue, had a reference to Mahatma Gandhi. “Everywhere I went, I saw the logo of the Clean India Mission- (Mahatma) Gandhi's glasses. In its third year of implementation, now is a critical time to replace the lens of those glasses with the human rights lens,” Heller was quoted as saying in the release. Government took a strong note of remarks on the logo of the Clean India Mission deploring that it showed ‘serious insensitivity towards the Father of the Nation’. The government’s statement said the world knows that the Mahatma was the foremost proponent of human rights. “Instead of taking the human rights approach to sanitation in a holistic way, a piecemeal approach is there,” Heller said in the press conference, and urged the government at all levels to impart a human rights perspective to its national programmes on safe drinking water and sanitation. Heller on Friday concluded his fortnight-long visit to the country during which he met several government officials and visited New Delhi, Kolkata, Imphal, Lucknow and Mumbai where he also visited a few slums. The expert, charged by the UN Humans Rights Council, to monitor, report and advise on the realisation of the human rights to water and sanitation worldwide, said he also found that in certain areas people belonging to the scheduled castes and scheduled tribes faced ‘discrimination’ in accessing toilets. “Eliminating open defecation is not just about building latrines,” Heller said adding that he had a "mixed perception" about the mission which was a unique initiative of India and launched by the Prime Minister himself. “On my last day in India, the website of Clean India Mission showed 53 million toilets built in the last years, in rural areas only, (besides in urban areas). I need to recognise that it is very impressive,” he said as he also brought up the issue of the human rights of manual scavengers. The government dismissed his preliminary findings as a rambling report and said it contained inaccuracies, sweeping generalisations and biases. “The report has been produced after only a two-week visit with fleeting trips to a few states and including some anecdotal reference,” the government said, asserting its highest commitment to human rights in general and water supply and sanitation in particular. Heller was also critical of the certification mechanism being followed while declaring a particular area open-defecation free (ODF).